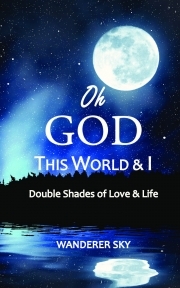 Description of "Oh God This World and I"
The book talks about the story of an intelligent, wise and kind man who failed to sustain the false pressures of the corrupt society, leading him to take the dire step that ruined his life forever. The story takes a whirlwind turn when the handsome boy turns physically ugly and instead of getting appreciation, praise; he has to bear the scornful eyes, humiliation, loneliness and unwanted, useless status of the society. Still, he manages to witness and participate in all the facets of life like success in business, spiritual love, charity, empowerment of the backward people. Finally, with his purpose of life on Earth accomplished, he rises from the ugly body to travel back to where he came from - GOD. Reviews of "Oh God This World and I"